Although it is a little bit expensive, its features are worth it. The Humminbird 410010-1 HELIX 12 Chirp DI GPS Fishfinder was highly appreciated by the experts and professionals. Similarly, the AutoChart live feature was also encouraged because now you can yourself create live and digital maps of places where a map is not pre-drawn. Fish finders are the perfect device to locate fish in any water body. Humminbird fish finders are above all because they cover a lot of areas in the US. 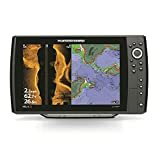 The Humminbird 410010-1 HELIX 12 Chirp DI GPS Fishfinder is the talk of the town because it has many user-friendly features which make it easy to use such as the 360 imaging which allows you to see everywhere in the water. The five preset views are an added benefit in this machine. The HELIX 12 has an HD Radar and display which shows clear cut images even in harsh weather conditions such as extreme sunlight or fog. More of its features are mentioned below. The all new Humminbird HELIX 12 Chirp DI GPS Fishfinder has the best systems for locating fish i.e. The SwitchFire sonar, down imaging sonar, Dual beam plus Sonar, Internal GPS, and Precision GPS systems. The SwitchFire Sonar allows you to completely control how your sonar returns, with the clear mode and the max mode. Moreover, the down imaging sonar lets you see from a fish eye’s view of beneath your boat. The Dual beam plus sonar lets you cover more area along with the two GPS systems combined. All of these systems are ready to give you a perfect fishing experience. The HELIX 12 machine has the Contour XD Cartography. In simple terms, this feature means that maps of nearly 3000 US lakes are drawn along with full-fledged information about them i.e. the depth capacity etc. This fishing tool also recognizes several other locations, without contours. Humminbird products are always satisfying for the customers. Same is the case with the HELIX 12. This machine has the all new NMEA 2000 technology which means that you have a perfect fishing network. Not only this, but there is an upgradeable software so you can have your machine updated online. The updates include recent information on weather predictions, depth of the water bodies and other information on fishing.